Successful students have been using traditional flashcards since 1834. SpeakToYourMind combines time-tested flashcards with additional learning techniques. The resulting combinations give you a variety of ultra-effective studying methods to help you learn and remember your content. Just by using the software, you'll benefit from the learning techniques below. The learning technique of active recall presents you with a question and then challenges your brain to independently retrieve the answer. This brain exercise moves information from your short-term memory into your long-term memory, so you can effectively recall the information you learned at a future time. Research on active recall shows this is an extremely effective method of learning. Many students are unaware of the power of active recall. Yet most students have been exposed to flashcards, which are based on active recall, at some point in their lives. SpeakToYourMind incorporates this fundamental learning technique of active recall in all of the flashcard software's modules. Researchers have been studying the beneficial effects of confidence based learning for over 80 years. Confidence based learning measures the quality of your knowledge in the content you are studying. The combination of these two measurements provides results accurately identifying what you think you know vs. what you actually know, helping you focus your time on the flashcards you need to study. The ultimate goal of confidence based learning is to achieve both high confidence and correctness in your answers for 100% of your content. SpeakToYourMind implements confidence based learning in the Perform a Self-Assessment module. 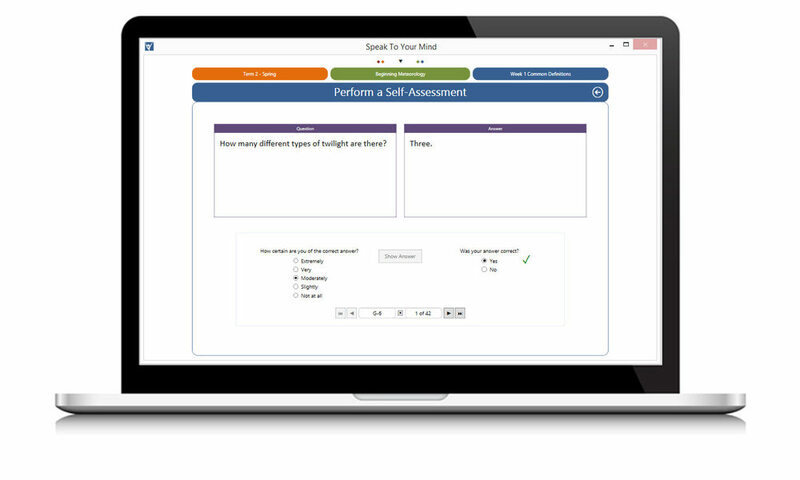 The results of your self-assessments are automatically sorted into 10 confidence categories providing precise feedback on your current knowledge of your flashcards. You are more likely to remember the information you are trying to learn if you use more of your senses during the learning process. By reading, listening, and writing your flashcards, you are using your visual, auditory, and kinesthetic senses. SpeakToYourMind gives you the control to interact with your flashcards using the senses of sight, sound, and touch, so you can utilize the sensory learning techniques most effective for you. A test is an academic exercise using a set of questions to measure your knowledge. Studies repeatedly show taking practice tests based on the mental exercise of active recall is an effective learning technique. Promotes remembering your content on a final test - a phenomenon called the "testing effect"
SpeakToYourMind lets you take an unlimited number of practice tests and track your results using the Take a Random Test module. Like to be more confident in what you know? Build your confidence with these learning techniques.